This Church Wedding in Rhode Island was held in one of the most beautiful churches I have ever seen. The family of the bride has been coming to this space for years, and the bride has received all of her other sacraments in this magnificent building. It made sense that she would want to enter into the covenant of matrimony with the man she loves surrounded by these familiar walls. Marriage in the Catholic Church is the joining of a couple in true partnership and unconditional love. It is an everlasting bond that is strengthened by God as the couple move forward in love and faithfulness. The scene of the this Church Wedding in Rhode Island was exceptional in both setting and the feelings brought on by the ceremony. The domed apse of the church is the first, and most notable aspect of the room. Intricate designs cover this area of the ceiling and at the very center of the dome is the image of Jesus on the cross, the heart of the Church. The length of ceiling continues on with detailed images painted across it all the way to the back of the church. Some of these painted details represent biblical images and symbols, but others are merely meant to enhance the architectural majesty of the space. 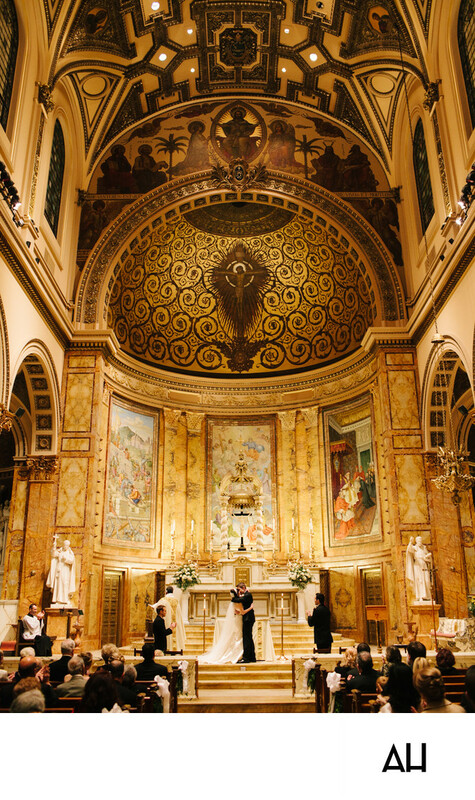 The windows that line the walls just below the ceiling are rounded in a Romanesque style and fractured sunlight filters through their glass, shining down on the bride, the groom, and the altar. The altar space is bright, with artfully painted murals lining the walls behind it. These murals provide a lovely backdrop for the couple who stand at the center of the photograph. In the midst of the ethereal beauty that surround them, the bride and groom embrace and share their first kiss as husband and wife.